Circuits is our last game in Digital Tentacle. It's a musical puzzle game for iOS, Windows, Mac and Linux. Music and levels have been created by David García, an amazing person and composer. We have used Unity to develop this game. This game is about music. In each level you have music you have to copy using audio clips. You have to do different task like set clips position, set loop counter, etc, to build the final song. To create a level we use a custom editor inside Unity. This way, the levels are created very quickly. 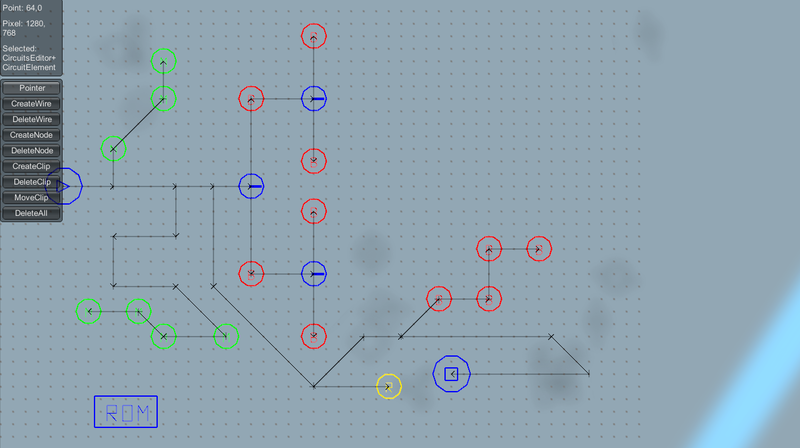 To generate the playable level, it is only necessary to press "Generate Circuit" button. We save all our music as an OGG file. Rename these files to TXT. This way unity imports them as TextAssets. We use a C++ OGG decoder as Unity plugin. The input is a OGG file as TextAsset and the output is an array with the OGG file decompressed. We create a class called ClipMixer. This class has a method AddAudioBuffer( AudioBuffer _buffer, float _time ) that we use to compose the song. When all AudioBuffers have been added, the AudioClip is created: AudioClip.Create( "ClipMixer", mSamplesLength, SoundManager.mChannels, SoundManager.mFrequency, false, true, OnAudioRead, OnAudioSetPosition ) We know the length of the clip because we calculated it on AddAudioBuffer method. Channels and Frequency are constants, and OnAudioRead and OnAudioSetPosition are callbacks because the clip is created as stream. Every time OnAudioRead is called, we know the start position and the length required, so we calculate which AudioBuffers are involve and mix just the required parts of that AudioBuffers. 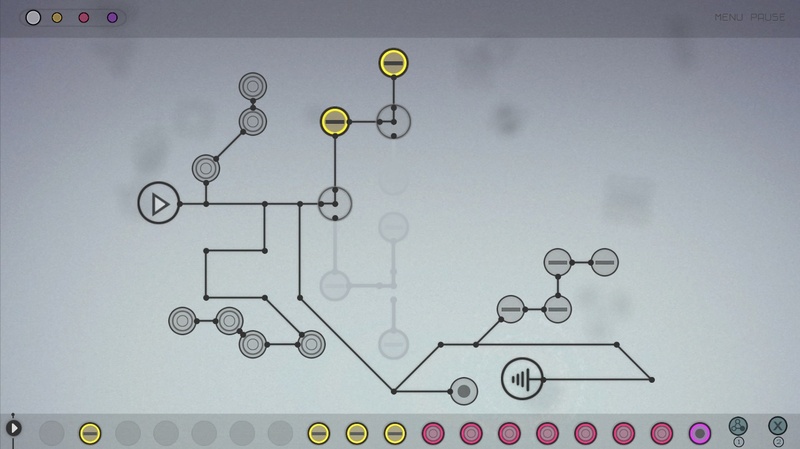 In the latest update of the game we included the Circuits composer. With this program the users can create their own songs using a huge sample library (that is in continuous grown) created by Circuits composer David García and by Circuits users. The created songs and packages can be share on Steam Workshop. In iOs the game is distributed free. With the free version you can only play a few levels and the game contains ads. If you want all levels and remove the ads you have to buy the complete version of the game. You can do this inside the game as ingame purchase. Besides, you can buy also some extra points to use different powers inside the game and a package with new audio clips to use in free gameplay mode. We have implemented a coupon system so we can create coupons (8 letters long alphanumerical string) and decide the action of that coupon. A coupon can unlock the full game, give you some extra points and/or unlock the extra audio clips package. This way, we can send coupons to magazines to review the game or to our friends and give them the full game for free. We enter in our website and create a new coupon. You have to set the game, the platform, the action and the number of uses of the coupon. After this, you have the coupon, for instance: A9XKE3LS. hash_key value is computed use some game information and a password. The server knows how to calculate this, so it compares the petition key to the generated key and if are differentes, it will ignore the petition. Besides, the server check if the coupon exists and is valid (same game, same platform and has not been used before). Server response to the game with a string than contain the information about the actions of the coupon and with another different key to secure the response. The game knows how to calculate the server response key, and if they are differentes will show an error message in the game. Update: In the end we decided to sell the complete game without a demo. So, although the whole coupon system was working, we didn't use it.